The old adage “there is strength in numbers” is not always true, especially when it comes to science. Science is not advanced through polls or consensus. Observation and experimental evidence is what matters. Thankfully, being in the minority does not necessarily mean one is wrong. 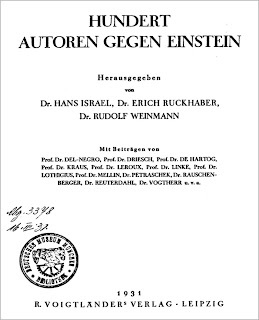 Case in point: The book Hundert Autoren Gegen Einstein (A Hundred Authors Against Einstein), a collection of various criticisms of Einstein’s theory of relativity. Published in 1931, it contains short essays from 28 authors, and published excerpts from 19 more. The balance was a list of 53 people who were also opposed to relativity for various reasons. The book was not a reaction against Einstein from the physics community—only one physicist had contributed. Nor was it supported by the younger generation—only two of the contributors were much younger than Einstein. It was a dying cry from the old guard of science that felt left behind by the new physics and incompetent because they didn’t know what to do with it. Before Einstein published his work, Newton’s theories were gospel among the scientific community. Einstein had the temerity to use space and time as a way to think of our Universe, not just an a priori condition in which we lived. Many had a philosophic objection to relativity, based on Immanuel Kant’s assertion that space was intuitive and could not be perceived by observation or experience. Newton’s view that space was absolute and existed independently of what it contained, as defined by Euclidean geometry, had ruled for over two centuries unchallenged. Einstein’s fame from the success of his ground-breaking theories had created a backlash. Even thought the book contains no outright anti-Semitism, six of the authors were either anti-Semitic and/or Nazi sympathizers. 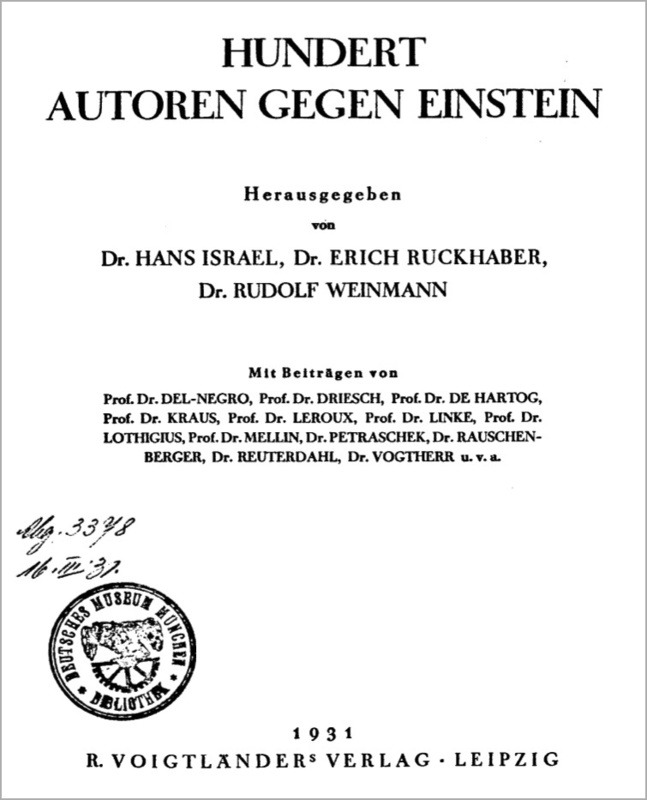 The rising Nazi movement denounced Einstein, calling relativity “Jewish physics”. Einstein left Germany in 1932 out of fear for his safety and never returned. The Nazis had put a price on his head, publishing his photo on the cover of one of their magazines with the caption “Not Yet Hanged”. Einstein moved to the United States, settling at the Institute for Advanced Study at Princeton in New Jersey. Of all the contributors to the book, the one that I found the most distressing was Emanuel Lasker. Lasker was a German mathematician, philosopher and the World Chess Champion for an incredible 27 years. Einstein and Lasker had met through a mutual friend in Berlin in 1927, and over the course of many walks together they exchanged opinions about a variety of topics. According to Einstein it was a somewhat lopsided exchange, in that Einstein received more than he gave. Nonetheless, they developed a close friendship. Given that Lasker was also Jewish and had been forced to leave Germany after the Nazis took power, it’s disheartening that he had gone against his friend, but apparently it didn’t bother Einstein. To Lasker, the notion that no matter how fast you travelled the observed speed of that light was constant was ridiculous. Einstein claimed to have “never considered in detail, either in writing or in our conversations, Emanuel Lasker’s critical essay on the theory of relativity” and thought of Lasker as a Renaissance man and uniquely independent. Many years later, when asked to write the forward to a posthumous biography on Lasker, Einstein was forced to address this reproach to relativity, saying that “…chess playing of a master ties him to the game, fetters his mind and shapes it to a certain extent so that his internal freedom and ease, no matter how strong he is, must inevitably be affected”. In other words, Lasker—while brilliant—lacked the capacity to think outside the box.